there is no parking at the Chalet in winter. over-snow transport on arrival and departure (Fri. & Sun.) Skier pickup every afternoon from quad chair 4.30 - 5pm. 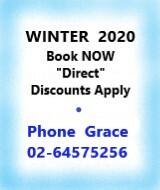 "Perisher on snow accommodation where you can Ski Perisher Resort from the door." Try a winter snow holiday in Australia's largest ski resort, Perisher. We have 100 groomed runs and 47 lifts, that's a lot of skiing! After you've had a big day skiing the slopes, this is the place to come.... Chalet Sonnenhof! 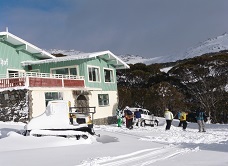 We have comfortable lodge accommodation, with splendid views over all Perisher Valley. All rooms have tea and coffee making facilities and en-suites. Chalet Sonnenhof is a family owned and operated chalet, where you can relax and put your feet up, or enjoy a sauna and spa, before lounging around the bar. on those cold wintry evenings.